Travel blogger James Clark visualized what the region would look like if all its transit goals are achieved. I envision it to be a cross between China’s high-speed rail network and Europe’s international InterCity services. With a single visa for ASEAN, an InterCity-style train would be able travel from Bangkok to Phnom Penh in four hours, and a high-speed train in under three. Based on his research and experiences, Clark designed a subway-style map of the region that weaves potential future train lines into the current existing network. The not-yet-built railways include those that are currently under construction, those that have been proposed but not yet deemed feasible, and those promised by politicians. A few (less than one percent of the total distance of new lines) are also his own recommendations, to “fill in the missing gaps,” he writes in a detailed blog post explaining the map. The map below shows the close-up of the region that’s just south of the map above. A key railway line has been proposed between Kanchanaburi, a town in the West of Thailand, and the port of Dawei, in Myanmar. 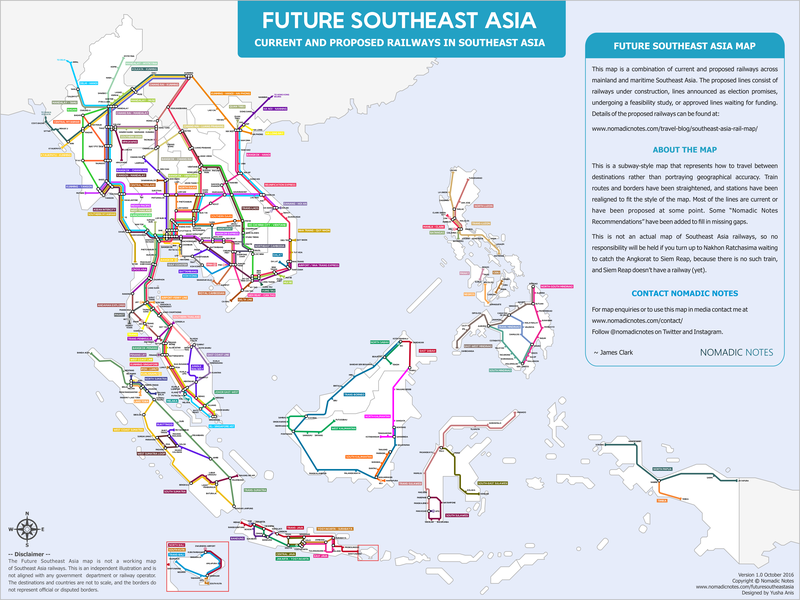 Another, on the east, would connect Bangkok and Phnom Penh for the first time. On the bottom right, there’s a small link between Saigon to the coastal town Mui Ne. “I’ve placed this partly for selfish purposes as I would sure love to be able to get the train from Saigon to the beach resort area of Mui Ne for weekend getaways,” Clark writes. That’s kind of the spirit of this enterprise—a mix of practical travel info and imaginative transit fan-fiction. Clark’s map isn’t entirely comprehensive; he has purposely left out a few unbuilt railway lines either because there wasn’t enough information about them, or because the map didn’t have enough room. Clark is also open to suggestions on additions and edits: If you’ve got an opinion about how to get around better in Southeast Asia, here’s how to reach him.